Loreto holds 300 years of history, as the oldest town in the peninsula of Baja California, protected by the Giganta Sierra, and the Sea of Cortez. Contrasting beautiful colors as the green blue of the sea, with the greenness of the vegetation and the islands. Jesuit father, Juan Maria de Salvatierra, founded the first mission in southern California, “our lady of Loreto”, on October 1697. Loreto was the starting point to colonize the rest of the peninsula. There are great places to explore as the nice beaches, such as el Juncalito, Ensenada Blanca, Ligui where you can practice kayaking, snorkeling and windsurfing. The Islands which offer something for all tastes, like the Del Carmen Island that has incredible beaches, Danzante Island with rocky edges, that makes very interesting for scubadiving and the Catalana Island great for ecologists with amazing flora and fauna. For those who enjoy sporfishing, Loreto is the right place, offering a variety of species like, mahi, sail fish, Wahoo, yellowtail and others. If you prefer golf, this town has the perfect infrastructure, a modern 18 hole golf course, located in the corridor Loreto-Nopolo. Also has a magnificent tennis center with 9 courts and a stadium, considered the best in the country. 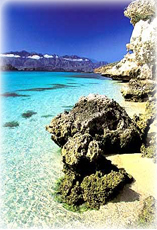 You can arrive to Loreto by plane, to it’s International airport, by bus and by car of course, finding five star hotels, excellent services, car rentals, restaurants, arts & crafts shops, RV parks, etc. - A City tour, visiting the first mission founded in1697 by the Jesuits, the mission museum, the tennis center and the golf course. - Spending time playing tennis or golf. - A 33 km. Tour through la Giganta Sierra, to San Javier Mission founded in 1699, the second mission founded in the peninsula, and very well preserved, an unforgettable experience. - A whale watching tour only 90 minutes from Loreto by car you can find the Gray Whale sanctuary in their yearly visit to Baja California Sur, the season lasts from December to March.